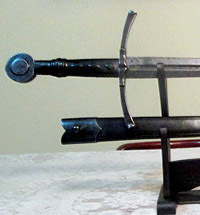 Windlass Swords (Windlass Steelctafts), based in Uttaranchal, India are one of the oldest sword companies still in production. 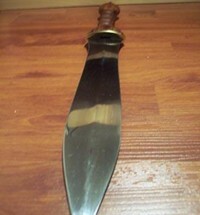 Established in 1943 by Mr VP Windlass the company was originally founded to supply Khurki Knives to the British Army. 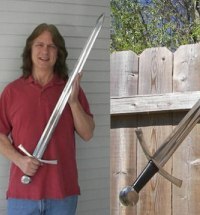 In the late 1970s they began to export their swords to the US and have over time grown to dominate the market for functional medieval and ancient sword replicas. 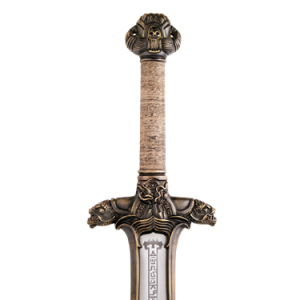 However, true to their roots, they also continue to supply various military organizations throughout the world with their ceremonial swords, and have even made quite an impact in Hollywood – with their swords being selected for use in the movie itself and the officially licensed replicas. 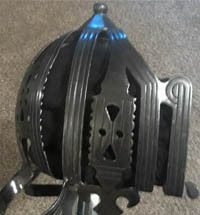 Famous for using good quality steel (from 1065 to 1095 carbon steel, depending on the requirements of the sword) and heat treating it with a specialized state of the art heat treating furnace, the end result is an extremely consistent product. Shipped unsharpened as standard (with a 1mm edge) many places offer a decent sharpening service for an additional fee if required. 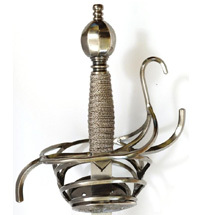 Probably their most popular line, Windlass Steelcrafts makes a huge variety of one handed and two handed medieval swords as well as a reasonable number of Renaissance rapiers and ‘Musketeer’ swords. 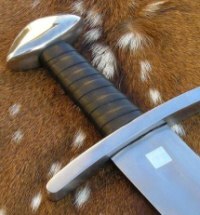 The general consensus in the sword community is that their short and one handed swords are on the whole nicely done, though their longer swords can sometimes tend to be too thin and ‘whippy’ for any real practical use (though this does vary from model to model). 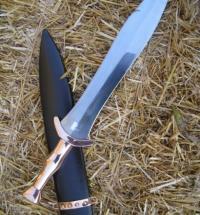 While Windlass Steelcrafts make a small selection of Ancient Greek and Roman swords – the historical accuracy of these blades tends to be left wanting, though many are quite serviceable and functional – just the attention to detail is often somewhat off. 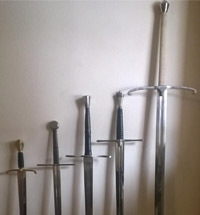 Most of the swords in this line have been around for years and comes across as something of a side project compared to their medieval line. 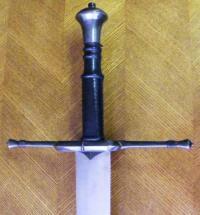 However as the steel is so good, they are worth modifying for those requiring a more historically accurate sword. 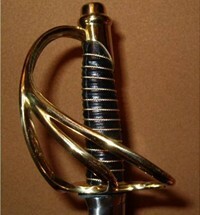 Naturally, as they are contracted by the armed forces to produce good quality Military Presentation Swords – Windlass Steelcrafts also make many of these swords available to the public, as well as more historical blades such as American Civil War Swords and other fine Cavalry Swords. 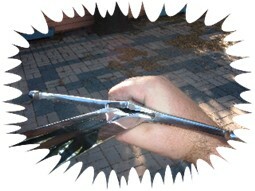 Considering the price tag, these blades are exceptionally good value for money and easily the best on the market. As such, they make great authentic gifts for friends and family in the military. 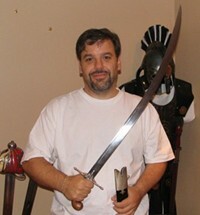 Perhaps the second biggest part of their business, Windlass Steelcrafts produce a large variety of officially licensed movie swords – both for the actual industry itself and the fans. 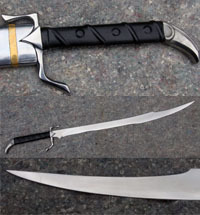 Unlike most other movie swords, Windlass movie replicas are considered to be fully functional and made by the exact same processes as their other blades. 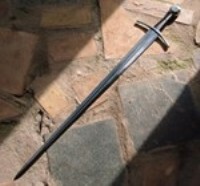 They have a small selection of fantasy swords – and have dabbled in this area for several side projects, but they tend not to stay in production for very long. 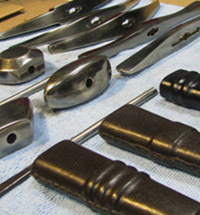 Forged from high quality, high carbon steel and tempered with the most advanced heat treating processes available they produce a consistent – if mass produced – product. 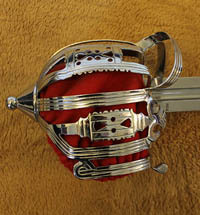 Both flexible and light weight, these swords are ideal for practicing historical swordplay techniques and on the whole are nicely balanced with a distal taper to properly distribute the swords weight to closely approximate the historical originals. 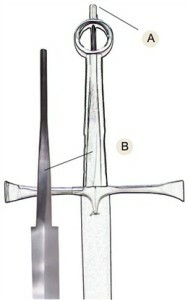 As you can see from the diagram – Windlass swords are (A) of threaded or peened construction with (B) the tang forged as part of the sword. 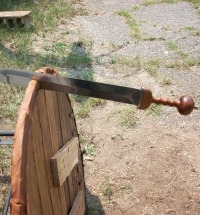 The end result is a sturdily made sword that can handle shockwaves that travel down the blade into the handle on impact. While they are not shipped sharp, with a 1mm thick edge they are easily sharpened – though some sellers can save you the effort and have them sharpened up with a beveled edge for a small additional fee. 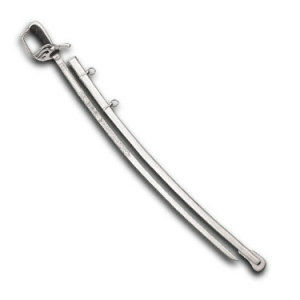 Apart from the usual kind of Quality control issues often found on mass produced swords at this price point – Windlass Steelcrafts are most often criticized for two main things – overly whippy blades and poor hilt construction. 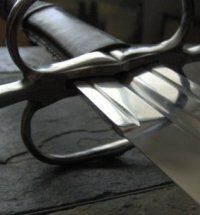 The heat treating process that makes their swords so reliably flexible often seems to become problematic on their longer swords. 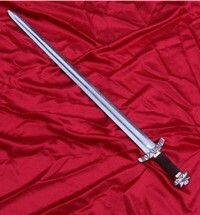 A general rule of thumb is that any blade over 32″ is almost definitely far too whippy to use as it was intended, and practically useless for thrusting. 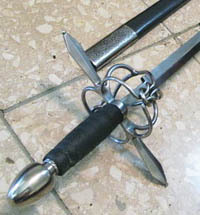 The second most common issue is that some Windlass swords have a somewhat rattly hilt construction that makes a disconcerting ‘tink-tink’ sound when wielded. 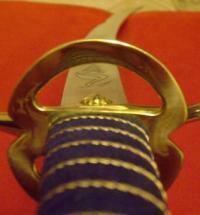 Most of these swords can be identified by the ‘V’ shaped shoulder which tends to leave a small gap between the blade and the hilt. 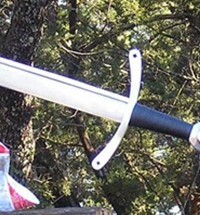 Easily enough fixed by shimming (sticking something into the gap) or an application of polymer epoxy resin, this is actually more annoying than anything else and does not effect the swords overall durability. 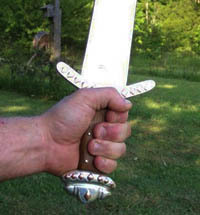 Windlass Steelcrafts swords are available from their retail arm in Atlanta, Museum Replicas Limited HERE (Museum Replicas is owned by Windlass Steelcrafts). 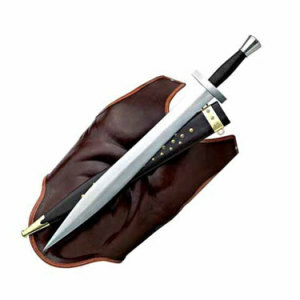 There are often various discount coupons on offer if you know where to look for them - and if not, we have a special discount code SBGVIP for a 10% discount on all swords that you can use. 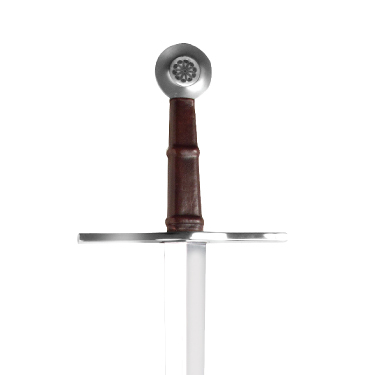 Otherwise, the best place to pick up Windlass Swords is here at Kult of Athena, where they stock them at prices equal to or even below what MRL offers them for including the 10% discount.